When your child is having an explosive anger attack or enraged response to something, do not get in his face. This is the worst thing you can do with a kid who’s in the middle of a meltdown. As long as your child is old enough, we would recommend that you not get anywhere close to him. You have to remember that kids with explosive anger are out of control. The adrenaline is pumping and all rationale has left the body. They are in fight or flight mode, about to blow up. How close do you really want to get to that? By getting in there with your child, you will likely only further ignite their anger. And if you try to say something to them in the middle of it, you’re just going to fan the flames. We often feel like we have to stand right there and handle the meltdown with our kids. But if nobody’s getting hurt and it’s not a life-threatening situation or safety issue, it’s better to back off and give them some distance. After all, if you saw an angry stranger in a store, you wouldn’t go up to him and start yelling or rationalizing, would you? You’d probably leave the area as soon as possible! When your child is angry, rather than reacting out of emotion, which will escalate things, do whatever you need to do to step out of the situation. Walk away, take some deep breaths, and try your best to stay objective and in control. Take a time-out if you need one (and if your child is old enough for you to leave the area). Use some phrases to remind yourself, “I’m going to respond to this logically instead of emotionally. I’m going to stay on topic. I’m not going to get off track.” You might also remind yourself, “One step at a time. None of this is going to happen overnight.” Part of our job as parents is to model how to handle emotions appropriately. (Easier said than done, we know!) When you’re upset, your job is to show him good ways to deal with the emotions at hand. Your child may not be wrong for feeling upset. There may be some justification for his anger, even if the behavior is not justified. When parents tell us they’re upset with their child for being angry, we say, “Is it not okay for him to ever just be disappointed and unhappy and mad? Because everyone feels that way sometimes.” Remember that people can be justifiably disappointed and may present that in an angry way. If your child can’t be respectful in explaining his viewpoint, then you’ll need to leave him alone until he calms down. You can say, “I understand you feel angry; I’m sorry you feel that way.” Then leave it alone until he’s cooled off. If it turns into a temper tantrum where he’s saying foul things, breaking objects or hurting others, then that’s when you want to address the behavior. 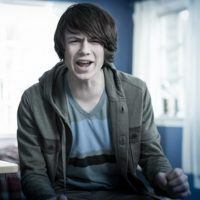 You can’t in any way control the way your child feels about things—all you can do is give him consequences and hold him accountable for his behavior. Getting mad at your child for being mad will only escalate the situation. Always ask yourself what you’re aiming for as a parent. What is your end goal? One of our most important jobs is to show them appropriate, healthy ways to behave as we give them some problem-solving tools. It’s not only important to discipline our kids, but also to teach and to guide them. Sometimes lessons don’t require a consequence, but are rather an opportunity to talk and help your child come up with a better way to handle the situation next time.